CALGARY, Sept. 26 2018 /CNW/ - E3 METALS CORP. (TSXV: ETMC) (FSE: OU7A) (OTC: EEMMF) (the "Company" or "E3 Metals") is pleased to announce it has begun the development of its field pilot plant which will incorporate E3's proprietary concentration technology to further validate the lithium extraction component of the process flow sheet. This technology has the potential to unlock significant value from E3's expansive lithium resources of 6.7 Mt LCE (inferred)1 in the Leduc Reservoir in Alberta. E3 Metals owns 76 Alberta Metallic and Industrial Minerals Permits totalling over 596,000 hectares, or over 1.47 million acres. Our current resources cover only 34% of the total Leduc Reservoir that E3 Metals currently holds. The further development of E3's lithium production step involved in the generation of lithium hydroxide and lithium carbonate will occur at commercial facilities and with partnering EPC firms. This allows E3 to continue to de-risk its proposed lithium production flowsheet (Figure 1) and advance towards technical disclosure through a pre-feasibility study of its direct-brine process. E3's proposed lithium production flow sheet, outlined in Figure 1, breaks into three main steps. The first step involves pumping the lithium enriched brine from the Leduc reservoir to the surface. The second step is creating a higher-grade lithium concentrate that utilizes E3's proprietary ion-exchange process. The third step generates the final lithium product (lithium hydroxide or carbonate) by further purification, electrolysis and crystallization. One of the differentiators that sets E3's project apart is the Leduc Reservoir's ability to produce vast quantities of lithium-enriched brine. Unique to this reservoir, a single well could produce more than 10,000 m3/d (116 l/s). In the Clearwater Resource area alone, the reservoir contains enough brine to produce 50,000 tonnes LCE/yr for over 35 years1. In Alberta, lithium enriched brine is currently being produced at surface and is subsequently re-injected back into the reservoir through oil and gas production facilities. E3 plans to use this produced water at surface for the pilot project and avoid the capital costs associated with drilling a well. 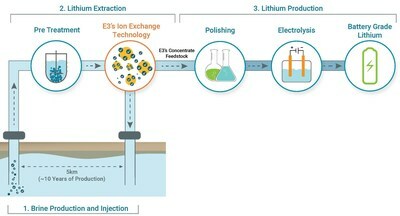 The development of the lithium extraction technology by E3 Metals, chemically filters the lithium from the brine to form a concentrate, with the lithium void waste stream being re-injected back into the reservoir via a sealed ("closed-loop") system. E3's technology utilizes ion-exchange, a well understood process capable of treating large volumes of water. E3 has developed a proprietary chemical sorbent for use in the ion-exchange process that is highly selective for lithium and consequently has very low selectivity for other metals such as Mg and Ca (see E3 Metals May 29, 2018 announcement). This process happens rapidly, in about 3 hours, as opposed to 18-24 months for conventional evaporative solars. As such, E3 has demonstrated that it has the ability to rapidly concentrate and clean the brine in one step. This produces a relatively clean and high-grade concentrate feedstock for the third step of the lithium production process. E3 Metals is working with several commercial facilities and EPC firms who have infrastructure and expertise in place to take E3's concentrate feedstock and generate a lithium product. One of the benefits of E3's process flow sheet is the flexibility to produce either lithium hydroxide or lithium carbonate. E3 is focusing its efforts on developing a high purity lithium hydroxide due to the premium paid for the product by battery cathode manufacturers. This process involves electrolysis and crystallization to generate lithium hydroxide and is similar to processes utilized by other lithium companies globally. There are potential capital and operating cost benefits associated with the production of lithium carbonate and E3 is therefore exploring both alternatives in tandem. The planned operation of the pilot plant and the subsequent testing of E3's concentrate feedstock in conventional lithium extraction process facilities at this scale will allow E3 to complete the front-end engineering design (FEED) for a process facility. During this time, E3 plans to upgrade a portion of its 6.7Mt (million tonne) Inferred resource to Measured and Indicated and complete a full cycle project economics analysis to pre-feasibility study (PFS) level. At this point, E3 intends to produce a compliant PFS 43-101 report outlining this information to the market. The spot price for lithium carbonate is between USD 12,100 to USD 13,000 and for lithium hydroxide between USD 18,100 to 18,8002. E3 Metals is a Petro-Lithium company rapidly advancing the development of direct recovery lithium brine projects in Alberta. E3 Metals holds lithium resources at 6.7 Mt LCE (inferred)1. The Company has a compelling competitive advantage by virtue of having access to extensive infrastructure built by the Oil and Gas industry in Alberta. This has provided E3 Metals with low finding costs, as the Company has been able to sample existing wells to define its resource. This infrastructure may also provide wells and pipelines for a future lithium production operation, potentially reducing the Company's future capital requirements. The Company's goal is to develop a commercially viable lithium extraction and production process and to demonstrate the economic viable of commercial production of its Alberta Petro-Lithium brine resource. More information about E3 Metals can be found on our website by visiting: www.e3metalscorp.com. Chris Doornbos (P.Geo), CEO and Director of E3 Metals Corp., is a Qualified Person as defined by NI 43-101 and has read and approved the technical information contained in this announcement. This news release includes certain forward-looking statements concerning the potential of the Company's projects to produce saleable lithium byproducts, including LCE, the future performance of our business, its operations and its financial performance and condition, as well as management's objectives, strategies, beliefs and intentions. Forward-looking statements are frequently identified by such words as "may", "will", "plan", "expect", "anticipate", "estimate", "intend" and similar words referring to future events and results. Forward-looking statements are based on the current opinions and expectations of management. All forward-looking information is inherently uncertain and subject to a variety of assumptions, risks and uncertainties, including the speculative nature of mineral exploration and development, fluctuating commodity prices, the effectiveness and feasibility of emerging lithium extraction technologies which have not yet been tested or proven on a commercial scale or on the Company's brine, competitive risks and the availability of financing, as described in more detail in our recent securities filings available at www.sedar.com. Actual events or results may differ materially from those projected in the forward-looking statements and we caution against placing undue reliance thereon. We assume no obligation to revise or update these forward-looking statements except as required by applicable law.